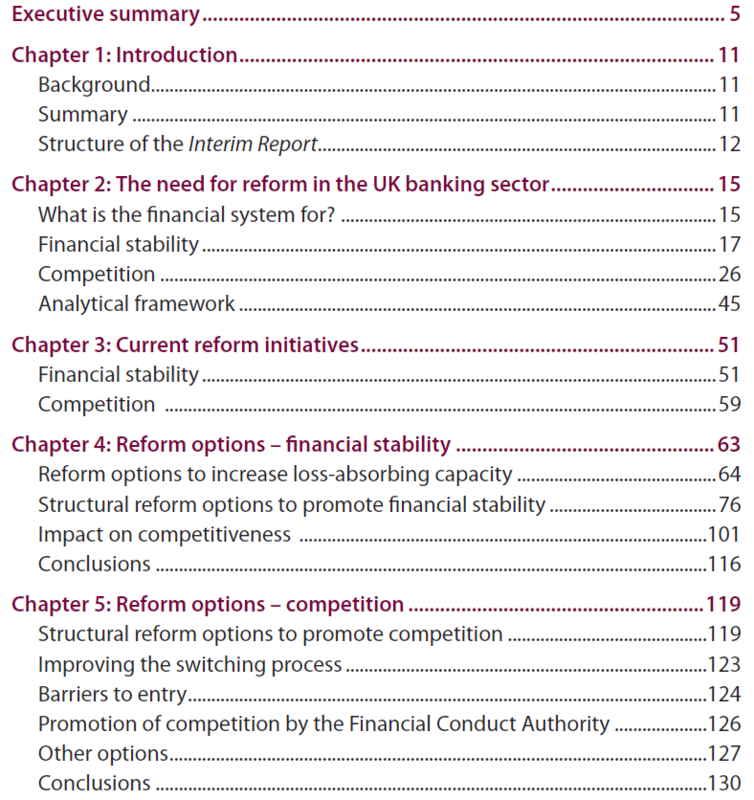 The report begins by summarising the impacts of the financial crisis on the UK banks. Despite recent de-leveraging, the total balance sheet of UK banks is more than four times annual GDP. More than 80% of RBS and more than 40% of Lloyds are in state ownership. Competition in UK banking has been seriously weakened as rivals to the largest retail banks have left the market or been absorbed into others. curbs incentives for excessive risk taking. Banks ought to face market disciplines without any prospect of taxpayer support, but systemically important banks have had and still enjoy some degree of implicit government guarantee. This is the ‘too big to fail’ problem. Unless contained, it gives the banks concerned an unwarranted competitive advantage over other institutions, and will encourage too much risk taking once market conditions normalise. It also puts the UK’s public finances at further risk, especially given the size of the banks in relation to the UK economy. Banks must have greater loss-absorbing capacity and/or simpler and safer structures. … The Commission, however, believes that the most effective approach is likely to be a complementary combination of more moderate measures towards loss-absorbency and structure. While Basel 3 suggests a minimum capital ratio of 7% the Commission suggests 10%. In the Commission’s view, the available evidence and analysis suggests that all such banks should hold equity of at least 10%, together with genuinely loss-absorbent debt. That would strike a better balance between increasing the cost of lending and reducing the frequency and/or impact of financial crises. Subject to that safeguard for UK retail banking, and recognising that wholesale and investment banking markets are international, the Commission believes that the capital standards applying to the wholesale and investment banking businesses of UK banks need not exceed international standards provided that those businesses have credible resolution plans (including effective loss-absorbing debt) so that they can fail without risk to the UK taxpayer. And the first novel suggestion to rank depositors ahead of other unsecured creditors in a wind-down situation. Loss-absorbency and stability might also be improved by ranking the claims of ordinary depositors higher than those of other unsecured creditors. Ring-fencing a bank’s UK retail banking activities could have several advantages. It would make it easier and less costly to sort out banks if they got into trouble, by allowing different parts of the bank to be treated in different ways. Vital retail operations could be kept running while commercial solutions – reorganisation or wind-down – were found for other operations. It would help shield UK retail activities from risks arising elsewhere within the bank or wider system, while preserving the possibility that they could be saved by the rest of the bank. And in combination with higher capital standards it could curtail taxpayer exposure and thereby sharpen commercial disciplines on risk taking. The report notes that retail and wholesale/investment banking can be distinguished, which is interested, since Martin Wolf who is on the Commission has been quoted as noting this is not feasible. Separation between retail banking and wholesale and investment banking could take various forms, depending on where and how sharply the line is drawn. While mindful of regulatory arbitrage possibilities at the boundary, the Commission believes that there are practicable ways of distinguishing between retail banking and wholesale and investment banking. For the most part, retail customers have no effective alternatives to their banks for vital financial services; hence the imperative to avert disruption to the system for their continuous provision. Customers of wholesale and investment banking services, on the other hand, generally have greater choice and capacity to look after themselves. The Commission recognises the ultimate firewall would be to separate the types of banking into separate structures, however it notes the benefits of universal banking would be lost. It is not clear what that means, and I will leave that for later analysis. However it will require overall capital and loss-absorbing debt rules for universal banks, as well as for the sub division retail bank. This will make for interesting reporting and also for definition of the rules between reporting periods. The Commission is therefore considering forms of retail ring-fencing under which retail banking operations would be carried out by a separate subsidiary within a wider group. This would require universal banks to maintain minimum capital ratios and loss-absorbing debt (as indicated above) for their UK retail banking operations, as well as for their businesses as a whole. Subject to that, the banks could transfer capital between their UK retail and other banking activities. The report then goes on to discuss improvements to competition. One proposal in particular will drive bankers nuts. They note that Lloyds has 30% of all UK current accounts. So they are proposing a ‘quick switch’ methodology be provided within a reasonable timescale. This Interim Report suggests that it may be possible to introduce greatly improved means of switching at reasonable cost, in which case the industry should be required to do this within a short timescale, and that barriers to entry may be able to be reduced. I got this summary from their length Executive Summary which reads more like a report, because I wanted to get an overview. Now I have a better idea of what they are suggesting, I will dig into the main report, and have a better idea what I am looking for. UK banks will be safer as a result of the increased capital requirements but so what – they are already nationalised. Where is the direction to un-nationalise them. That is what I am looking for. Lord Myners was financial services secretary from 2008 to 2010. He indicates in this op/ed in the Financial Times that he has had a change of heart and recognises the British banks are simply to large and expose the UK economy to too much risk. To ensure a further contribution, Sir John should note that Britain’s banks are too concentrated and that each individually represents too great a portion of gross domestic product. Indeed its high operating margins and return on equity suggest the UK has one of the world’s most concentrated and least competitive banking systems. Two lines of inquiry follow. First, is such concentration good for banking and its customers, given there is no compelling evidence that scale provides economic or service gains? Second, after Sir John’s commission, will any of the banks remain too big to fail, financially or socially? He goes on to make the case for more smaller and more nimble banks in order to encourage a healthy and lasting banking system. Britain is similar to Ireland in that it has large banks that form a relatively large part of the British economy and carry implicit government guarantees by virtue of government ownership. They form therefore part of the national debt in event of a failure. Worse, consolidation has accelerated over the past decade, with the crisis leading to yet more mergers, increasing the power of existing banks. The implicit support the most important of these receive from government is now a competitive advantage and barrier to new entrants. Yet some argue it follows that these large, concentrated banks create a more stable system than a market filled with numerous, smaller competitors. And finally this from here. But Lord Myners’ views echo a growing belief that the five-member Commission on Banking, chaired by Sir John Vickers, will focus more on the issue of high-street competition than the complex structural question of whether retail and investment banks – “casino banks” – should be allowed to remain under one roof as so-called universal banks. There has been much talk of systemic risk since the financial crisis hit. I see it more as a crisis of banking and banking confidence, and the debate on systemic risk is critical because it exists because of Government intervention and protections, implicit and explicit. The latest from Lord Turner of the FSA is a discussion paper, that reviews systemic risk and provides as good a discussion on that topic as I have seen. What it particularly interesting is how the insights raise the prospect of penalising globally integrated banks over nationally independent organizations with higher capital requirements. Things just got more complex for decisions on integration. systemic by size. This can be a function of the firm’s absolute size or in relation to a specific financial market or product in which a firm is particularly dominant. The channels through which systemic risks would crystallise as a result of the failure of such a firm include: losses to uninsured creditors and depositors through high bankruptcy costs and reduced recoveries; disruption to financial services (such as to payments, clearing and settlement, extension of credit); and losses to insured depositors because the DGS could not pay out sufficiently quickly or because the aggregate payout imposes unsustainable costs on those who fund the DGS. In addition and crucially, systemic risks can take a macroeconomic form, with the loss of credit extension capacity leading to, or exacerbating, a downturn in economic activity which then has consequences for the rest of the financial system. self-reinforcing spiral between lower market liquidity and funding liquidity. systemic as a herd. The market can perceive a group of firms as part of a common group (for example, because they have a similar business model, such as building societies in the UK and the savings and loans banks in the US), or common exposures to the same sector or type of instrument. A single firm in this group may not be systemic in its own right, but the group as a whole may be. The management of UK banking/ financial system has become highly politicised reflecting the general Browns government style. This from the meeting yesterday between Mervyn King, Governor of the Bank of England and the Commons committee. This is nice to see. Lloyds is was the most risk averse bank before the crisis. Yet after the Government intervention and Lloyds ‘takeover’ of HBOS with all their self inflicted mortgage problems, the situation altered dramatically. I hope Lloyds will be a survivor, and can remove government ownership. Lloyds Banking Group has repaid £2.3bn to the UK Treasury after strong support for its open offer and placing aimed at repaying the government’s £4bn of preference shares. Lloyds is believed to be the first major western bank to repay state equity in the round of bailouts that began last year. It appears the weakness in the UK banks that showed first when the crisis hit, were foretold 5 years ago in a BoE simulation. Banking regulators identified Northern Rock as the weak link in Britain’s banking system during secret “war games” held as long ago as 2004, the Financial Times has learned. The risk simulation planning, conducted by the Financial Services Authority, the Bank of England and the Treasury, made clear the systemic risks posed by Northern Rock’s business model, and its domino effect on HBOS, then the UK’s largest mortgage lender. The degree of shift that has occurred and is occurring as we speak with respect to bank valuations is simply staggerring. 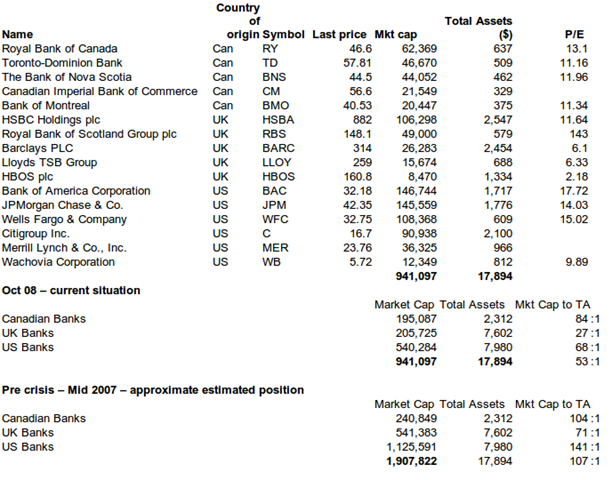 What got me going on this was when I noticed that the combined market capitalisation (stock exchange value of a company) of Lloyds Bank, Barclays, and HBOS was less than several of the Canadian banks. So with the valuable assistance of Google Finance here are some statistics, with some notes following. The question will be: which banks can break out of this with their customers and gain at the expense of the others. CitiBank are trying to do it in the courts in the fight with Wells over Wachovia. That sounds like desperation to me. They (Citi) were caught out with a ridiculously low offer for Wachovia, a panicked US Federal Government accepted the offer, and now they are left to find a respectable way out. Wells are always innovative, and make good use of internet and trying to understand current / new customer behaviours, so I hope they make it. Wells/ Wachovia would offer national coverage, and a real competitor to Bank of America. That reason alone is good for consumers, and would be a good reason for the Government to let it proceed. Which banks will take advantage of their internet presence to improve service to an increasingly Gen X/ Y oriented customer base, and reduce costs, with a view to building their way out.